Decking- spaced sheeting- The structural component of the roof of a building which provides the substrate to which the roofing system is applied. This decking system is used in conjunction with wood shingle roofing systems to allow the shingles to breathe. In order to install standard shingles a layer of plywood needs to be applied over the sheathing. Velux Skylight: Velux skylights are a popular brand of skylight that we install that has energy saving glass that protects the inside of your home from the sun rays and prevents heat loss in the winter. This skylight comes with a flashing kit that can be replaced when the roof needs to be redone without incurring the cost of a new skylight. Plumbing Stack- A pipe that penetrates a roof and is used to vent a building’s plumbing. Bathroom Exhaust Vent- This connector pipe takes the hot moist air from the bathroom and exhausts it to the outside through the vent. Vent (mushroom) -An opening or device used to permit air or vapors to exit an enclosed structure. Vent (bird resistant)- a vent designed to keep birds or other animals from entering into the building. Power Fan: A motorized fan used to exhaust hot or moist air out of an attic space. 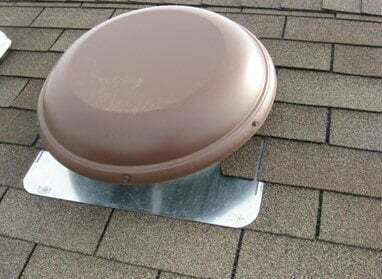 A ridge vent is installed on the ridge of the roof and is covered over with cap shingles so that the roof and roof line is clean and smooth. 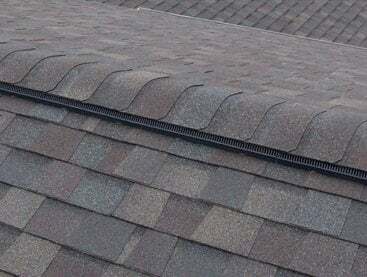 This is the most effective form of static vent because it is open the entire length of the ridge. A large saddle that does not empty into an open are causing water to back up on heavy rains. It also accumulates drifting snow in the winter and needs special attention to diverts water around a corner without backing up under the siding. Step Flashing- Metal counter flashing bent into the mortar joints of brick for use in protecting the top edge of flashings from exposure to weather.